This 2 day course will provide the skills required to help rescue any small craft. 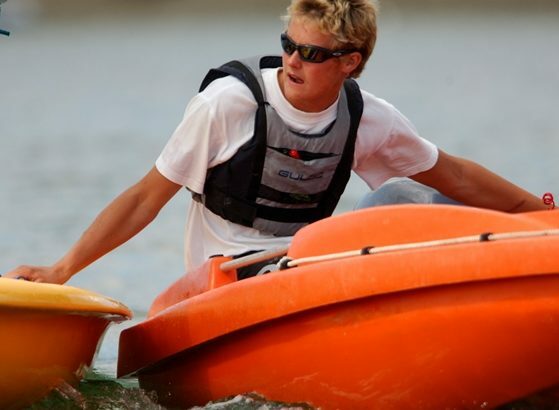 This qualification will enable you to act as a Safety Boat provider for racing or training activities. Most RYA courses and other training are normally done on demand. If you cannot see your required dates on the electronic calendar then please get in touch and we can add them for you, no problem!! Small craft rescue e.g. sailing dinghies, windsurfers or canoes and smaller keelboats. 2 days will be spent learning to cope with these various types of crafts on the water. The assumed knowledge for this course includes a basic understanding of sailing boats and windsurfers. RYA Powerboat Level 2 certificate must be held prior to this course with approximately 100 hours of helming. The Fal estuary is a stunning location to learn any powerboating techniques, over a mile across we are near Falmouth, Cornwall. You will learn the preparation prior to launching the safety boat. 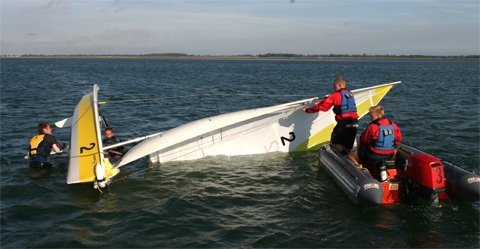 Boat handling skills and various craft rescues including dinghy, windsurfer, kayak or canoe (can be covered as theory). Towing safely depending on the type of vessel. Also included in the Safety Boat course are many safety aspects and the suitability of craft. You will learn to consider local factors, the best forms of communication and rescuing other water users. There are also end of day procedures to follow. The ability on completion of the course – you will be able to provide safety or support cover to a range of craft, particularly sailing or windsurfing. Excellent Power Boat course organised by Mylor Sailing School. Very experienced teacher, professional set up and great fun. When do you run this course? We can run this course at a time to suit you. Most of our courses are done on demand. We are open 7 days a week and all year round. Please get in touch to check availability and to book in. All clothing and equipment provided. This can be booked on a 1:1 basis or we can get you to join a group if preferred. We provide all the clothing and safety equipment you will need. You just need to wear plenty of warm clothing and we provide the wet weather trousers and jackets. At some point candidates will need to enter the water so a wetsuit will also be provided. The only thing we do not provide is footwear so you will need to bring something that you don’t mind getting a bit wet due to either rain or spray. For your footwear you will need either deck shoes/trainers or wellies This will all be explained in your booking confirmation once you have confirmed your booking. Normally for Powerboat Courses the maximum in a group would be 3 people plus the instructor. As this is a more advanced course with candidates holding at least the Level 2 certificate, there may be up to 6 people on the course. I have a physical impairment/health condition can I take this course? Yes yes yes!! Of course you can. Depending on the nature of your need we have a couple of boats, well trained staff and lots of great equipment to make this all possible. This includes a wheelchair friendly powerboat where the front flaps down to board with ease. Please do not hesitate to contact us if you have any specific questions. Please read our Access Statement at the footer of this site for further access information. If it rains will it still be on? Yes, we still go ahead with the training in the rain. We provide waterproofs to keep you as comfortable as possible. We also provide all the safety equipment. Do I have to wear a buoyancy aid/life jacket? Yes, due to the usual regulations, everybody that is going afloat will need to wear either a buoyancy aid or a life jacket for safety reasons. If you prefer to wear your own, we will just need to check it over to make sure it meets the required safety regulations. Mylor Sailing School is situated in a car park on Admiralty Quay. This is a Pay and Display car park but we have FREE passes so you just need to come and get one as soon as you arrive. At peak times, parking maybe a little tricky, if you are having trouble finding a space then just come and see us and we can block in some of the staff cars. Is sailing and powerboating sustainable/environmentally friendly? Mylor Sailing School is also a member of Surfers Against Sewage’s (SAS) 250 business club which is part of a network driving forward a movement for change to protect the UK’s unique coastal environment. Go to the Surfers Against Sewage website for all their details and campaigns. You can also get involved!! !